« More Ups Than Downs! Weather is hot! 90s yesterday and again today. 90s looks like the projection into the weekend. There is a slight chance of showers every day into next Tuesday. Not much relief in slight. No generation in the mornings the past three days. Prior to that, it was low flow in the morning and then a ramp up to a high one unit or low two. Really preferred that generation pattern to what we are having now. also from here in Missouri, out for half a day. Not a fast and furious day, but lots of fun and we caught fish on the CQ streamer, the hot hair nymph, the black zebra and a copper dun midge. The trip was a very thoughtful present from their son. 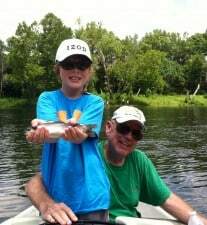 Sunday, Cassie and David from Kansas City spent quality instructional time on the river with Jim. 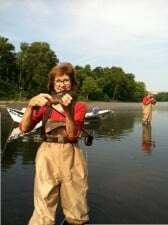 They are both new, fishing was slow, so they did a lot of skill and technique work. Monday, Stan and Carolyn took Vic, Ken, Debbie and Laura out for half a day. Of course, Carolyn took the ladies and Stan took the gentlemen. Lots of stories on this trip that will never be disclosed! 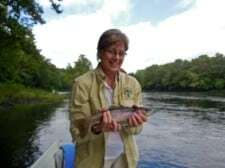 This was Debbie and Ken’s first time with a fly rod. both did well. Best patterns were the copper dun, P&P and the copper headed black zebra midge. Steven, from Illinois, on the water all day Tuesday with Jim. Jim said “tuff”. Worked for them, but caugut fish on the CQ streamer, the copper/black midge, a gray midge and an all black midge. Wednesday, it was James and Diane for a half day with Stan. Was off at put in, then one unit came on and then three units blew through at 1:00 p.m. Good for the drfit out! Best pattern was the copper dun midge. Trent out for half a day. They really could not find any best pattern either. Another “tuff” day on the water. Jim and Carolyn has the Louisiana Kerrs on the water all day. Once the water came on, it really fished better. Pulled fish all the way though to the take out on the CQ streamer, a P&P midge, the copper midge, the copper head black zebra and a size 18 gray scud or blood worm dropper. With these warm days, the oxygen is burning out of the water pretty quickly, especially when there is no generation. Consider going to 7X tippet and stay with the small size bugs. Slow down a bit when stripping patterns. Go early! Fishes fair early in the a.m. Once the sun has warmed up the edges, fishing starts slowing down big time! 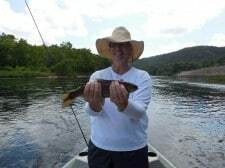 This entry was posted on Friday, July 19th, 2013 at 1:45 pm	and is filed under Fishing Reports. You can follow any responses to this entry through the RSS 2.0 feed. You can leave a response, or trackback from your own site.